AFRIN, SYRIA (Analysis) — In less than two months since Erdoğan’s Operation Olive Branch kicked off, the Kurdish “Rojava Project,” which aims for a unified Kurdish-controlled area in northeast Syria, has been delivered a strong blow. 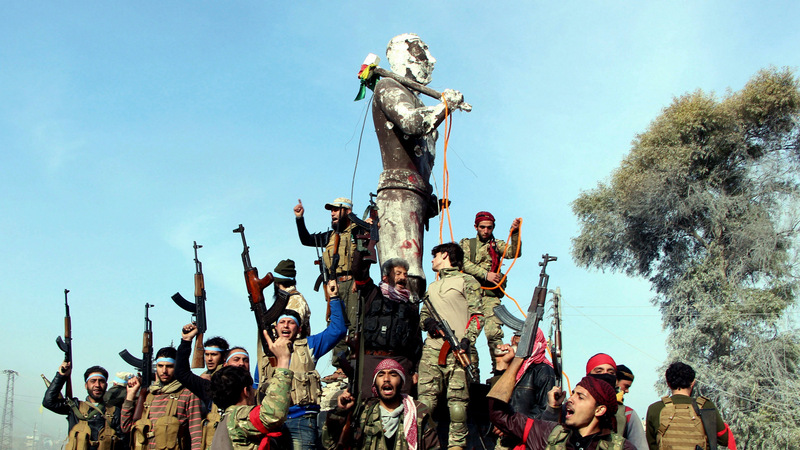 Kurdish militias have shown their inability to unite in the face of Turkish aggression. Even with forced conscription by the SDF, their inability to provide significant military support to Afrin shows a sort of betrayal and abandonment within the Kurdish militias, which will only weaken their plans for autonomy. During the past seven years, the United States has armed and supported various armed groups while claiming to be fighting against and defeating Daesh (Islamic State/ISIS) in Syria. After support for groups such as the Free Syrian Army (FSA) and other groups, extremist elements came under international scrutiny for crimes against humanity, including beheadings, the United States decided to shift its support to Kurdish militias. Since the U.S. invasion of Iraq and the ongoing conflict in Syria, Kurdish militias have been romanticized by the media and U.S. politicians alike to justify a Western interventionist narrative in those countries. The People’s Protection Unit (YPG) is a Kurdish-majority militia that is the military wing of the Democratic Union Party (PYD), a Kurdish democratic confederalist political party in northeastern Syria. The YPG is the Syrian offshoot of the Kurdistan Workers Party (PKK), which is an organization based in Turkey and Iraq that has been engaged in armed conflicts with the Turkish state since 1984. The United States justified its military and economic support for the YPG by claiming they were the most reliable fighters in Syria against Daesh. In an attempt to disassociate the YPG from the PKK, General Raymond Thomas, the commander of the United States Special Operations Command (SOCOM), revealed — at a Security Forum on July 21, 2017 at the Aspen Institute — that he personally discussed the importance of changing its name with the YPG. As he states in the video below, he was impressed that they included the word “democratic” in their rebranding: their new name, the Syrian Democratic Forces (SDF), would help them enter into political negotiations, where they had been excluded previously owing to their association with the PKK. In an attempt to counter progress that was being made during the war by the Syrian Arab Army and its allies, the FSA and SDF have brokered deals and worked closely together at times. The SDF has been known to make questionable alliances — going as far as to work with Daesh, with the blessing of the U.S.
On April 28, 2016, while testifying before the Senate Armed Services Committee about the relationship between PYD/YPG and PKK, Defense Secretary Ashton Carter confirmed “substantial ties” between the two groups and stated that 20 percent of the PYD/YPG is Arab. What prompted Operation Olive Branch? On January 13 of this year, an announcement was made by the Combined Joint Task Force – Operation Inherent Resolve (CJTF-OIR) that the U.S. planned on assembling a 30,000-personnel team consisting of SDF and new recruits. This Border Security Force (BSF) was reported to consist of U.S.-trained fighters along Syria’s borders with Turkey, Iraq and the Euphrates, with the strategic aim of containing remnants of the Daesh. The U.S. State Department denied the implementation of any border security force by the U.S. government, referring to the new development simply as security training.This denial, however, did not deter Turkey from initiating Operation Olive Branch. This is Turkey’s second cross-border operation in Syria since the war began, the first being Operation Euphrates Shield, which was completed in early 2017. Euphrates Shield focused on targeting a “terror corridor” made up of Daesh and Kurdish fighters further east from Afrin along its southern frontier with Syria. After completing that operation, Turkey set up local systems of governance in the swath of land captured, stretching from the area around Azaz — located to the northeast of Afrin — to the Euphrates River and protected by Turkish forces present there. It seems that Turkey now aims to form similar governance systems in the Afrin region. Turkey, however, has stated that it does not plan on staying in Afrin and will hand over the land to the “real owners” once it has cleared out the “terrorists.” Turkey has not clarified whom it considers to be the “real owners;” however, some have understood this to mean the FSA. When the Turkish Armed Forces (TAF) and the FSA began Operation Olive Branch on January 20, some speculated that the United States might support its allies the Kurdish YPG fighters, as it has in the northeastern region. However, that support was not extended. Others argued that supporting the Kurdish militias against a NATO ally would have put the United States and Turkey in a direct conflict that neither nation would likely want. The alliance between the United States and Kurdish militias has been a very contentious point and has infuriated Turkey’s Erdoğan. He has on numerous occasions brought up the fact that he believes the United States is supporting a terrorist organization no different from the one he has dealt with within his borders. Turkey considers the Kurdish Democratic Union Party (PYD) in Syria, and its armed-wing YPG, to be “terrorist groups” with ties to the banned Kurdistan Workers’ Party (PKK). Turkey also considers these groups as a threat to its national security and has clearly stated that it will not tolerate such a threat. The United States and NATO, however, consider only the PKK to be a terrorist organization and have sought to create a distinction between these Kurdish groups in order to justify their alliance. By March 18, almost two months after Turkey’s Operation Olive Branch began, Afrin was captured by the TAF and FSA. That same day they established control over all the villages that had remained under the control of the YPG north and northwest of the city. Turkish forces captured a large number of weapons and anti-tank guided missiles that were abandoned by the YPG when they fled from Afrin to the government-held part of Aleppo. Two hundred various localities have been captured by Turkish forces across the area. It has been reported that 6,400 Turkish service members and over 10,000 FSA members were involved in this operation. Erdogan said on March 18 that 3,063 terrorists were “neutralized” in the operation and that 46 Turkish service members have been killed and 225 others injured in clashes that took place in Afrin. Reports from pro-opposition groups stated that 400 FSA members had also been killed and pro-YPG sources stated that 1,600 TAF and FSA members were killed. The conflicting casualty reports reflect the ongoing propaganda war. Other reports have also stated that 500 civilians have been killed in this operation. The YPG has accused Russia of working with Turkey and permitting it entry into Syrian airspace, which allowed them to carry out their mission. What the YPG doesn’t mention is that in the past two months Russia and the Syrian government have made numerous attempts to negotiate a handover of Afrin, whereby the city would be handed over to the Syrian armed forces in return for YPG protection and ending this operation. The YPG refused to allow the Syrian Arab Army (SAA) to enter and allowed only the National Defense Forces (NDF), a Syrian pro-government militia, to assist them, which was not enough to end Turkish aggression on Afrin. On March 19, Pentagon spokesman U.S. Army Colonel Rob Manning reiterated Washington’s criticism of Turkey’s operation in Afrin in a press briefing, expressing concern about the effect that fighting in Afrin has had on the effort to defeat Daesh. Erdoğan has called for the U.S. to respect Turkey as it prepares to expand its offensive against Kurdish militias. In basic terms, Turkey wants the United States to either cooperate with Turkey and forgo any alliances with Kurdish militias, or stay out of the way and allow it to “clean up” these areas on its borders. Turkey’s expanding military campaign against Kurdish militias will also include northern Iraq if Baghdad does not clear the PKK presence in that area. The plan to entirely eliminate YPG presence on Turkey’s borders also includes targeting YPG positions in Manbij, Ayn al-Arab, Tal Abyad, Ras al-Ayn and Qamishli. According to SANA, the Foreign and Expatriates Ministry in Syria stated that Turkish regime forces were contradicting UN Charter and international law with their illegitimate occupation of Afrin. They were called upon to immediately withdraw their invading forces from Syrian territory. The Ministry said in two letters sent to UN Secretary General and Chairman of the Security Council. Syria condemns Turkish and U.S. aggression and calls on both nations to immediately withdraw from the Syrian territory. Syria also demands that the Security Council assume responsibility, demand an end to such aggression, and work on the withdrawal of the Turkish regime forces. There is a lot of speculation about what will happen to Afrin now that it’s being bombarded by Turkish armed forces along with their FSA counterparts. Some reports claim that 200,000 Kurds have fled Afrin. They now join the 6 million internally displaced Syrians who have had to evacuate their homes during the course of the Syrian war. There’s been mention of Turkey moving between 350,000 and 500,000 of the 3.5 million Syrian refugees in Turkey from their camps to Afrin. Turkey had also suggested it does not want to maintain long-term presence in Afrin but instead would hand over the leadership to the “rightful owners.” One can assume they might be referring to the FSA opposition civil council. Some trust that Erdoğan will respect Syria’s sovereignty and hand over Afrin to the Syrian government, but, with a track record as volatile and unpredictable as Erdoğan’s, it’s difficult to know for sure. According to Turkish media sources, including the TSK on Twitter, the Turkish Red Crescent delivered humanitarian aid to the people of Afrin in collaboration with the Turkish Armed Forces. Other sources have shown the Syrian Red Crescent delivering aid to the civilians in Afrin. Images and video have also surfaced of the Turkish flag being raised, sometimes beside the FSA flag. A historic Kurdish statue was also toppled. Turkey has stated it would repair destroyed buildings and erect a half dozen military outposts in Afrin. Even with this “assistance,” Turkey’s presence on Syrian soil is unwelcome and has been a point of contention leading to protests in Aleppo. The battle in Afrin proved that NATO alliances are stronger than other alliances. This should send a clear message to the Kurdish militias that yet again they have been used as pawns to create instability and division in the region and that their dreams of an independent Kurdistan — whether it be in Syria, Iraq, Turkey or Iran — are not a concern, let alone a priority, for the United States. Any false hope they might be seeing with the U.S.’s military presence in Manbij or the Hassaka governorate should not distract from the not-so-distant history they have had with their U.S. backers. Therefore, it would be in the Kurdish militias’ best interests to realign themselves with the Syrian state and try to earn back some of the respect they have lost by their treasonous alliances. Whether or not that will happen will most likely be revealed in the coming days. Another good article by Sara, providing a chronology of events in the last mopntyhs. My question: Is it possible the Russians can influence Erdogan to handover North-syria back to Assad, once the Kurdish militia’s are gone? This would seem the best option for Syria, now. Thank you! I am glad you enjoyed my article. Ideally, that’s what we would all love to see, but Erdogan will most likely use it as a bargaining card. Some say he is already in negotiations to hand it over once he has cleared out the Kurdish militias. I think we will have to wait and see how this plays out. We can’t put much trust into what he says because he has been known to make a 180% turn at the drop of a hat. The silver lining here is that the Kurdish militias have exposed their weaknesses and have created enemies even within their own community. People will not easily forgive or forget what the YPG’s arrogance has cost them. Great article Sara! It is so hard to put all the pieces together in Syria and you explain it very well. Sarah! Sorry, I left off the “h”! Thank you! I really appreciate you reading and commenting. Glad to hear you liked it. A) The FSA/ilk have ZERO interest in governing. They ONLY destroy and loot. They’re just mercenary thugs. There should be no illusions about that by now, by anybody. B) Clannish Kurdish “leadership” fractiousness/terminal ineptitude has substantial long-term implications for holding areas east of the Euphrates where they are 10% of the population – now demonstrated to be a wholly feckless 10%. The disintegration is already happening around Raqqa. Perhaps an exploitable opening for the Syrian government to reunify. Exploitable Kurdish disintegration puts the US aggressive war/occupation in a different contrast. Perhaps unsupportable as naked aggression. But a big TBD on that. Great points! Thank you for making them. Do you think Turkey backing the FSA is destructive towards Syrian stability? Yes, but let’s remember that this isn’t something new, it’s been going on for years now. The difference now however is that Turkish troops are working alongside the FSA to remove any Kurdish militia positions on the Turkish border. The Syrian government plans on getting rid of all uninvited foreign backed militias/terrorists. The US and Turkey will be expelled and every inch of Syria will be liberated.